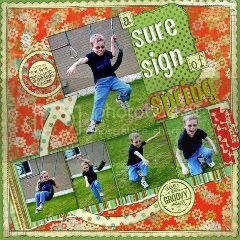 Ally Scraps: Spring has SPRUNG! April Design Team reveal! Spring has SPRUNG! April Design Team reveal! Do you want to see what we've done as a design team? First take a look at Kay's Spring Beauty layout! Her layering is always amazing, and I love how she did the title too! Check out the Pink Paislee Spring Fling collection, just back in stock at the store. 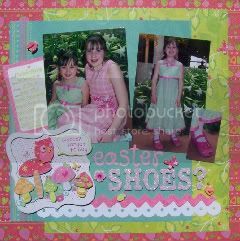 Also using the Pink Paislee Spring Fling collection is Debbie's super cool Sure Sign of Spring layout! These pictures are so fun and that awesome arrow is a great way to direct the eye to the main focus photo on your page. Love these papers with a BOY layout too Debbie! Morag used Pink Paislee too! It is so interesting to see how different layouts with the same paper can come out! 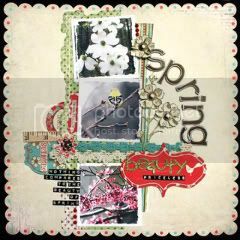 Love the fun title of her unSPRING layout... what a fun twist on a subject. Those flowers are just gorgeous... and the little birdie at the top reminds us of spring even in the snow! Awesome job Morag! 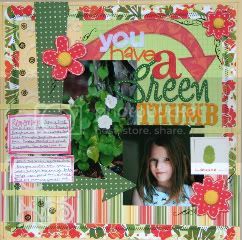 Here is Trish's Green Thumb layout... don't you love all the different fonts in her title? That is super cool... also love the really pretty spring colors of this layout. Scenic Route Providence is one of the prettiest new lines out there, take a look! 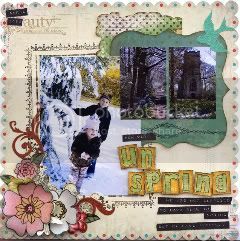 Check out Kary's Skatin' N-2 Spring layout! So many bright and boyish colors with this K and Co. Rough and Tumble line of papers.... Love how Kary used them, making a really colorful and energetic page. Super cool star AND arrow! And, here is my page.... with an owl just for Cathy! Whoooo forgot to buy Easter Shoes? using the pretty K and Co. Berry Sweet paper line! With a few owl, mushrooms and butterflies thrown in for fun! Thanks so much for checking out our pages... hope that you'll try the challenge too! Wow wee girls. Beautiful LO's - all so very individual. It's so fun to see what all the rest of you did! Adding Some Pop to Your Page!! New Teresa Collins "Bella Girl" is in DA HOUSE!! The Blog is a hit!